Our Garden Center is preparing for a beautiful new season! Mulches, Top Soil, Mushroom Compost, Decorative Stone, Boulders, Trees, Shrubs, Grasses, Perennials, Ground Covering, Grass Seed, and More! We provided great advice, service and delivery available. Please keep scrolling to see everything available! All of our mulches are treated hardwood. Single shreds are taken through the mulch shredder only once. Double shreds are taken through the mulch shredder twice. Mulching is a benefit for you and your plants. Mulch is a layer of protection that is applied around the base of your trees and plants. One of the most common materials used for mulching is shredded hardwood, which is available in many varieties. Adding mulch helps to prevent soil erosion. Mulching helps to control weeds. It helps to regulate soil temperatures. Adds beautiful color to your landscaping and gives a nice defined appearance. It retains moisture and helps the plants and trees develop strong and healthy root systems. For the d.i.y. gardeners and landscapers, Lawnworks stocks a beautiful array of plants and trees to adorn your new or existing landscape. We start with plants that are well established and hearty so the plants/trees blend into your landscape and do not take several months or years to catch up. Our trees on site are 2″ in diameter and bigger. You will find a nice variety of trees hardy for our western Pennsylvania climate. Popular Shrubs like Hollies, Hydrangeas, Boxwoods, Sand Cherries, Miss Kim Lilacs, and Knockout Roses. 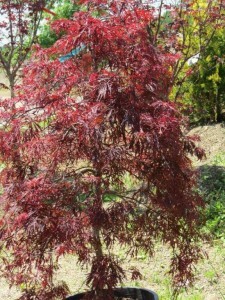 Trees and shrubs can be purchased individually or picked out for landscape designs planned by our landscape architects. Lawnworks stocks the largest variety of natural boulders in the area. Many sizes to choose from. Penn State Grass Seed sold by the bag or pound.